We really like bread, garlic bread, and yes, we really like cheese. So what better recipe than one that puts them all together and gives you a delicious treat to eat with any homemade pasta or pizza meal. This Cheesy Garlic Pull Apart Bread Recipe came from trying to think of another way to use my sourdough bread. I made a number of loaves that were eaten, and this one was a day old – which is definitely not bad, but is not fresh out of the oven. 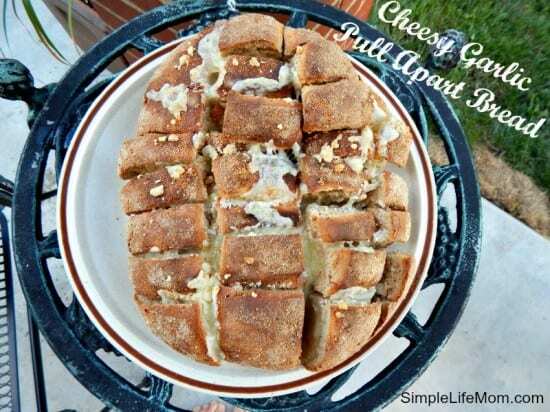 It was perfect for making into this cheesy garlic pull apart bread recipe though. If you do not have Sourdough bread, any of your artisan loaves will do. You can even get one on discount because it’s a day or so old. It will be perfect once you add the cheese and bake it again. If you want to make your own sourdough bread, check out my How to Make a Sourdough Starter page and Sourdough Bread Recipes. There you can get into making your own sourdough and reap all the health benefits from doing so. Once you have your bread, follow the steps below! A yummy cheesy dish for an appetizer or to go along with any homemade pasta or pizza recipe. With a sharp bread knife, slice the bread in strips horizontally and then vertically, careful not to cut all the way through. 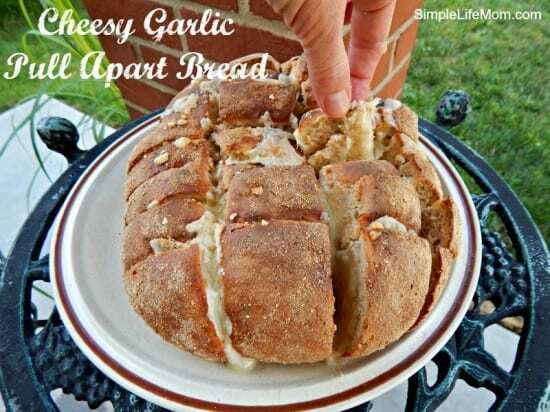 Sprinkle garlic powder and salt onto the bread, careful to get it into the crevices. Slice the cheese and carefully put the slices in the crevices of the bread. Bake at 200 degrees F for 15 minutes. OPTIONS: you can also add chopped chives, grilled onions, grilled mushrooms, pepperoni slices, or whatever else sounds good to you. Muenster cheese is my very favorite! My family loves it when I make artisan bread, and the combination of the two looks fabulous! Thanks for sharing. Pinning, tweeting, stumbling, and sharing on my FB page today. Hi Kelly! This bread sure does look good. I’m still remaking our old unhealthy favorites into healthier versions and this recipe is just what I need. I can’t wait to try it. We sure do love cheese in our house. This looks so yummy! My family loves bread. I was gluten free for a year that ended recently (health issues, not a trendy diet) so I am making up for lost time, and this looks like a great way to do that!! My family would LOVE this! I love that it uses a pre-made loaf. I’m always looking for quick sides that taste homemade, but aren’t totally! Pinning! Yes, this, croutons, and garlic toast are my go to’s for if a loaf I’ve made doesn’t get eaten right away. Like you said, it’s nice to pull together for supper when you’re not doing it from scratch that day. Thanks for sharing this on Homestead Blog Hop. This looks so delicious. I will be making this! I need to get some muenster cheese. This looks so yummy and beautiful. What a great appetizer or side! Garlic bread goes so well with almost any meal. Thanks for sharing your recipe with Real Food Fridays. Twitted! Thanks. What a simple idea. Basically just bread and cheese, but sometimes a fresh presentation really makes food seem special. Thanks for another great sounding recipe. If it is anything like the Monkey Bread, we’re gonna love it. Thank you so much Rhonda. I hope you really enjoy them. This sounds so delicious! It sounds like it would make a great side dish. Thanks for linking up at Natural Living Monday! I love garlic bread. Thanks for sharing on Real Food Fridays. Twitted.